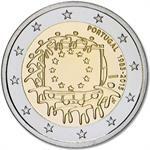 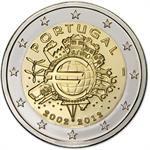 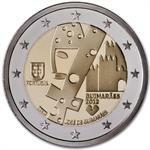 This annual BU set contains the eight circulating eurozone coins with the Portuguese national reverses, made by Victor Manuel Fernandes dos Santos. 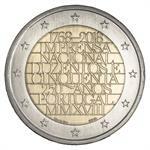 The designs feature three different motifs that are inspired by historical symbols and the insignia from Dom Afonso Henriques, Portugal's first king. 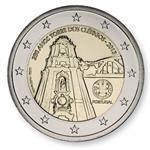 The packaging celebrates the first European Year of Cultural Heritage, an initiative that seeks to highlight the role of heritage in the social and economic development of the European Union by promoting social cohesion, diversity and intercultural dialogue. 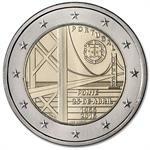 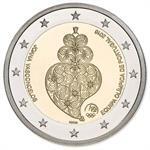 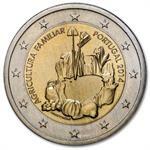 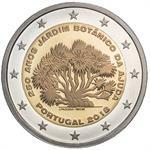 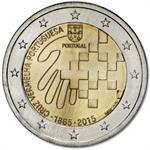 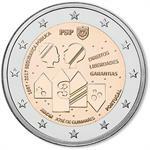 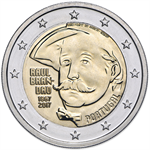 2018 Portugal €2 UNC Coin "Ajuda Botanical Garden 250 Years"
2018 Portugal €2 UNC Coin "National Printing Office 250 Years"
2017 Portugal €2 Coin Issue "Raul Brandao 150 Years"
2017 Portugal €2 UNC Coin "Public Security 150 Years"
2016 Portugal €2 Coin Issue "Portuguese Olympic Team in Rio"
2015 Portugal €2 Coin Issue "EU Flag 30 Years"
2015 Portugal €2 Coin Issue "Portuguese Red Cross 150 Years"
2014 Portugal €2 Coin Issue "International Year of Family Farming"
2013 Portugal €2 Coin Issue "Clerigos Church Bell Tower 250 Years"
2012 Portugal €2 Coin Issue "Guimaraes"
2012 Portugal €2 Coin Issue "Euro 10 Years"